The latest revolution in curling irons will change the way you style forever! This smooth-barrel iron provides exceptional flexibility and ease of use, with a spoon that rotates to give your wrist a rest! 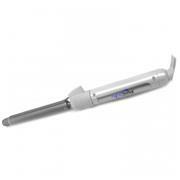 Just snap it closed, wrap hair around barrel and clip, and turn the collar to spin the spoon for perfect curls. The hybrid mineral complex eliminates frizz and smoothes hair by closing the hair cuticles for healthier-looking, shinier results.